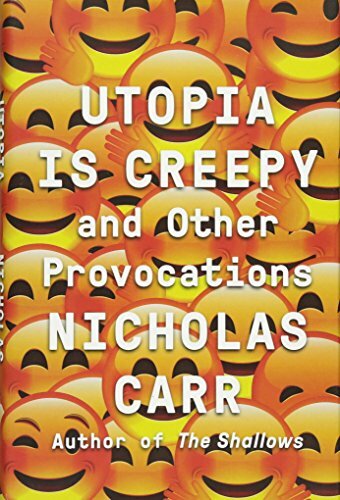 For those who missed Nicholas Carr’s stream of thoughtful and thought–provoking commentary over the past decade, Utopia Is Creepy and Other Provocations is a handy collection of his best hits for readers who want to see what all the buzz was about. The bon mot comes from his seminal blog, Rough Type, which started out in 2005 at the dawn of the blogging age. Seventy–nine pithy entries appear here, arranged in chronological order, along with sixteen reprinted essays and fifty Tweet-sized aphorisms in the manner of Rochefoucauld and Gracian. All these can be read in no particular order and are brief enough to bring respite from the digital deluge of the day. Carr would have us know that “Smart phones have made media machines of us all” while leaving us hardly empowered and seldom reflective. As engaging as social media may be, it has hardly proven to be a tool for self-enlightenment any more than “likes” and retweets have elevated civilized discourse and critical thinking. And yet we seem to be increasingly hooked on screens even while we bemoan our addiction to them. One of Carr’s analyses speaks to information overload. But overload isn’t the problem, he says. The real is “filter failure” in the sense that the original Google search for a needle in a haystack has morphed into haystack piles of needles that we struggle in vain to sort through. Digital filters make information we are genuinely interested in immediately visible and present. There is no end to alerts, push notifications, recommendations, and texts from all corners, each of which is tailored to our genuine interests. The paradox of modern technology is that “It’s all needles . . . The real source of information overload is the stuff we like, the stuff we want.” The problem is that as filters improve they not only magnify the piles of needles, but also leave us feeling compelled to tackle them. And so we’re constantly exhausted. “Burning Down the Schoolhouse” is a hilarious history of one technological fad after the next applied to the domain of education. For example, the launch of Massively Online Open Courses was hailed at the time by education secretary William Bennett as offering “an Athens-like Renaissance.” Alas his imagined tech utopia fizzled like those that went before it. The invention of correspondence courses once led experts to predict that the mailbox would replace the schoolroom. After that radio, then film, and then TV were going to revolutionize education. But all technologies of distance learning have had little effect on traditional schooling, and the schoolroom remains. ◆ The introduction of digital tools have never improved an art form. ◆ The returns on interactivity quickly turn negative. ◆ Personal correspondence grows less interesting as the speed of its delivery quickens. ◆ Social media is a palliative for the underemployed. ◆ Television became more interesting when people started paying for it. ◆ Mark Zuckerberg is the Potemkin of our time. Celebrated essays you may have missed are “Life, Liberty, and the Pursuit of Privacy, “Is Google Making Us Stupid?” and “Why Robots Will Always Need Us.” In “Smart phones Are Hot,” Carr attempts to explain Marshall McLuhan’s notion of a medium without content, which then itself becomes the message—a mind–twisting concept not so easy to grasp. He ends with five speculative thought pieces that bring us to the present. The questions worth thinking about revolve around how the Internet affects our quality of life, relationships, and the ability to nurture a satisfying inner life.